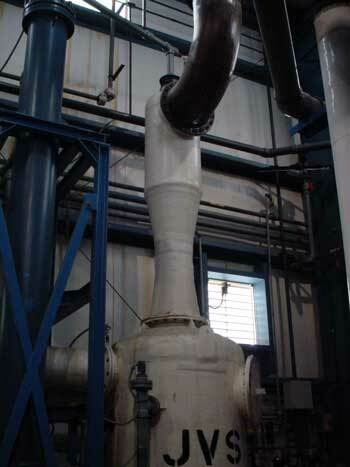 Thousands installed worldwide, the extremely versatile Bionomic Industries Series 6500 Jet Venturi Scrubber offers major improvements in operating performance and reliability over standard ejector, packed, tray and other scrubber designs whether the application calls for scrubbing high concentration gaseous contaminants, encountering a large variation in gas volume or when particulate must also be removed. A unique feature of the Bionomic Series 6500 that sets it apart from other ejector venturi scrubbers is availability of a proprietary multi -spray zone staging configuration that gives up to a 50% boost in collection efficiency performance. The scrubber features a simple, rugged design that utilizes a high velocity spray and scrubbing liquid flow to achieve simultaneous removal of gaseous contaminants and particulate down to .75 micron size. The Series 6500 with its high scrubbing liquid to gas ratio is also the ideal design for rapidly reducing the temperature of high exothermic reactive gases or to condense steam. Designed to provide near infinite turndown capability, the Series 6500 creates its own draft to eliminate the need for a fan in most cases – simplifying the system and related costs. Depending on the application and needed removal efficiency the Series 6500 is offered as a stand-alone device, with the addition of the proprietary multi-spray zone staging addition as well as a final polishing packed tower all complimented by a full range of mist eliminator and sump tank capacities. Achievable removal efficiencies are over 99.9% and gas capacity sizes from 5 through 60,000 acfm are standard. All Series 6500 configurations are also available in a pre-engineered ScrubPac™ skid mounted packaged scrubber system arrangement to fully meet the project and application requirements. Typical applications include; removal of gaseous and/or particulate emissions from process reactors and tanks in the chemical and pharmaceutical industries, as an emergency scrubber for ammonia and chlorine gas cylinder storage rooms, fume emissions from laboratory hoods and filling operations, scrubbing explosive or hazardous gases prohibiting presence of air or oxygen including syngas, lime slaker dust and NCG gases in the pulp and paper industry, ceramics manufacturing slip dust from material handling operations and an almost endless number of other applications.